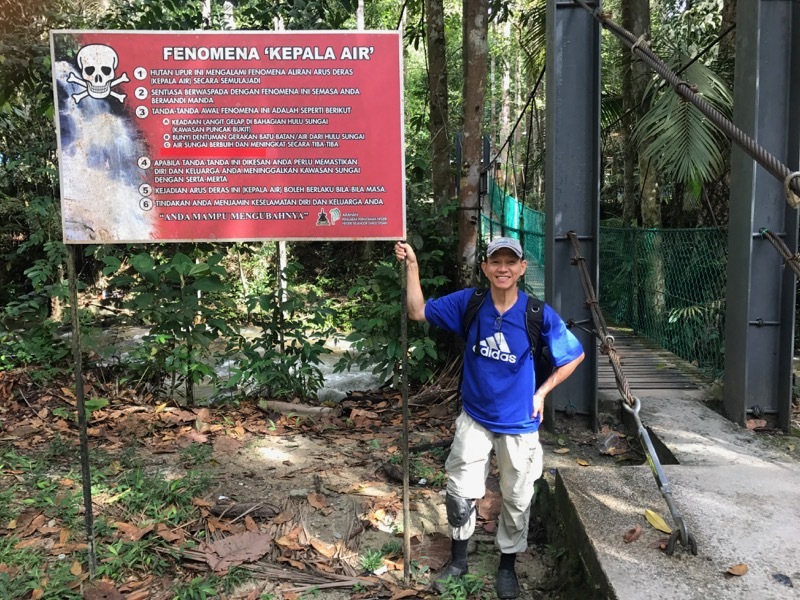 This is part 2 of a 7-part account of my trip to Peninsular Malaysia and Borneo in January/February, 2017. 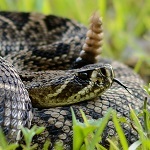 Part 1 featured 22 lifers out of 23 herps! 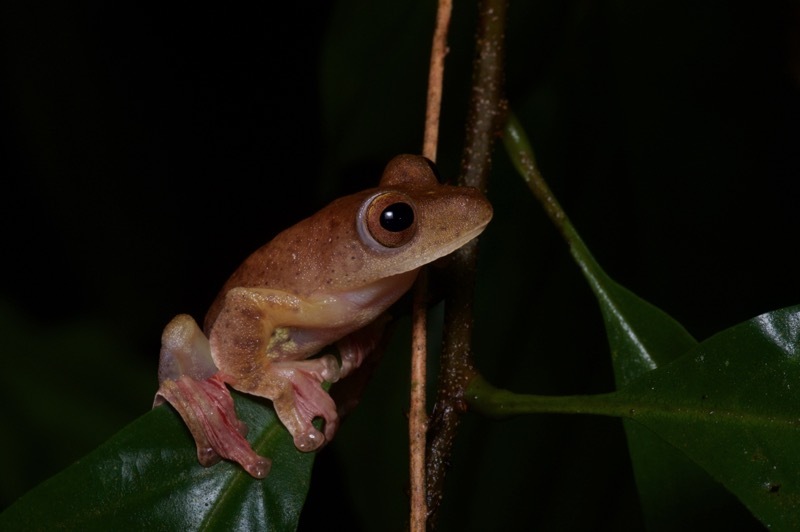 You'd think I should have been tired after arriving back at my Kuala Lumpur hotel at 4:30am following a long night of herping with Kurt "Orion Mystery" G, and a day after traveling halfway around the world in various planes. But jet lag and/or a head full of swirling thoughts about all the animals we had just seen kept me from falling asleep quickly, and woke me up a few hours later. The original plan had been to meet up with Kurt only in time for dinner and another night hike, but when I had asked him if there were any nearby places I could see day-active lizards he offered to take me to our evening's destination in the afternoon for some extra lizarding. A fine idea! 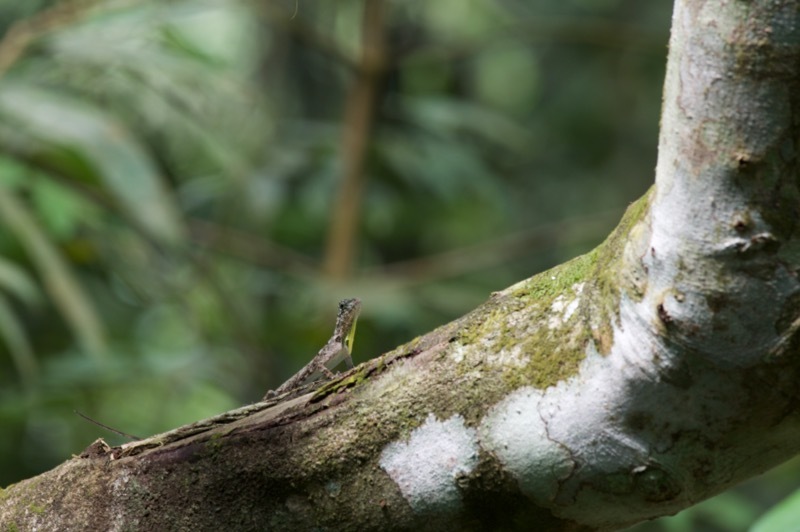 Like any reasonable person, I really wanted to see some flying lizards in Malaysia. They are sometimes found sleeping at night, but are generally easy to notice on sunny days when they move around a lot and flash their pointy little dewlaps at each other. When we first arrived at our herping spot, the sun was still shining a little bit. 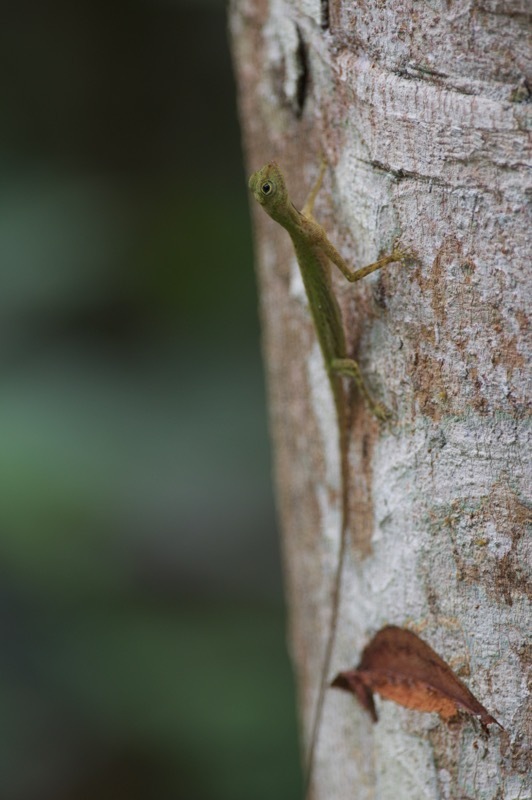 We quickly noticed a male Draco scuttling about on a large tree limb. It was a long distance away but seemed too nervous to approach closely, so I set up my tripod and got a couple of shots from my longest lens (300mm, not a crazy birder lens). Sure enough, it disappeared for good almost immediately. A couple of trees away from that one I saw another Draco clinging to the side of a tree trunk. It too allowed only a couple of shots before racing up to a crazy height. Soon thereafter, I noticed a similar-looking but significantly more terrestrial lizard standing motionless on a leaf near the ground. Unlike the flying lizards, it held its position as I took photos. It might have been standing there for quite a long time, because it was attached to the leaf by a couple threads of spider web. And then the sun went behind a cloud and stayed there, reappearing only rarely for the rest of my Malaysia trip. I saw no more flying lizards that day; I saw no more flying lizards in Malaysia. That's one reason among many to go back soon. Our primary lizarding target for the day was the splendiferous Gonocephalus grandis, which goes by a variety of common names, none of which adequately convey its magnificence. 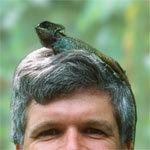 "Great Angle-headed Lizard" will have to do. They hang out near rivers and streams, and Kurt had never had trouble finding them in this area. So we followed the main waterway upstream and scanned the boulders and trees. Kurt scanning the boulders and trees. Where oh where are the Gonocephalus? I was amused by a very ominous sign next to a bridge, which I naturally dubbed The Bridge of Death. Kurt explained that the sign was referring to the dangers of the water, not the bridge itself, but I choose not to believe him. 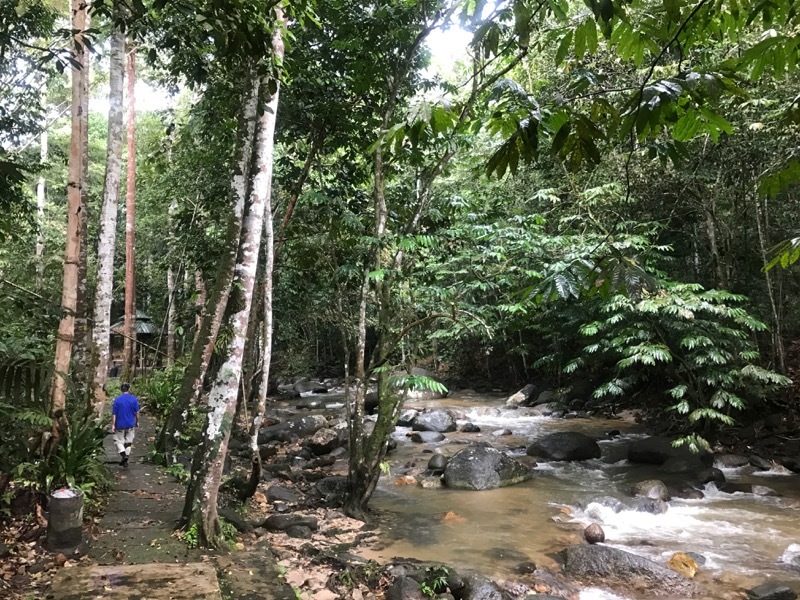 We had walked to the end of the stream-adjacent trail and most of the way back with no more agamid sightings, when Kurt spotted our target lizard on a large tree maybe 50 feet away, overhanging the water. I set up my tripod and took a couple of photos from that distance, fully intending to carefully move closer after these voucher shots. Then a downpour kicked in, and we grabbed our equipment and scurried to the nearest rain shelter. I have so far neglected to mention that we were accompanied on this afternoon adventure by a very friendly local dog. 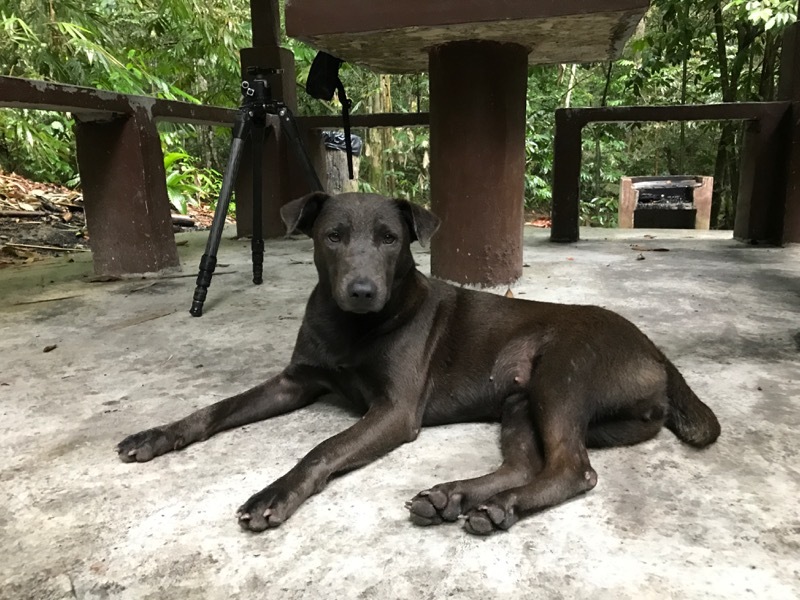 At first Kurt thought that this was the same very friendly local dog that often greets him here, but it turned out to be a lookalike dog of the opposite gender. She wisely hung out with us under the rain shelter as the rainstorm raged. We waited half an hour or so for the storm to abate, which it did not. 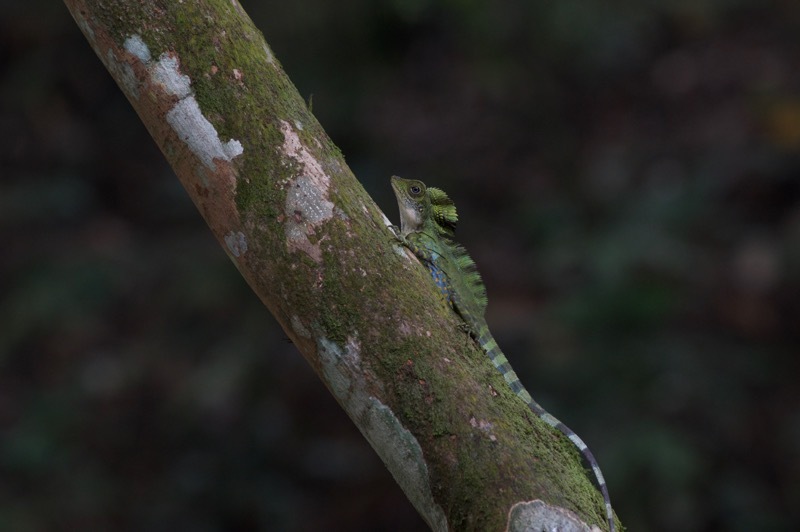 We both left our camera equipment safely covered and wandered around a little outside of the rain shelter, where we each found another Gonocephalus grandis clutching a tree, each in a non-photogenic spot. Kurt guaranteed we would see at least one at night, when it hopefully wouldn't be pouring down rain, so we gave up on the day session, said farewell to our new canine friend, and headed back to the car. We returned a couple of hours later, after filling our stomachs at a reasonably nearby Indian restaurant. As soon as we got out of the car our canine companion from the afternoon greeted us happily, now with a light-colored male dog acolyte. The two of them stuck close to us for the rest of the night, which probably didn't help with the herp count but was pretty entertaining anyway. Near the end of the night Kurt's original friendly local male dog friend popped by to join the party also, and seemed a little perturbed at the light-colored male dog horning in on his lookalike girlfriend. But they worked it out among themselves and we had three bouncy furry companions to conclude our evening. What animals did we see that night other than Canis lupus familiaris? I'm glad you asked. I only took photos of one invertebrate on that night, but it was a particularly good one: a Trilobite Beetle. This was either a large larva or an adult female, since it looked like a trilobite. 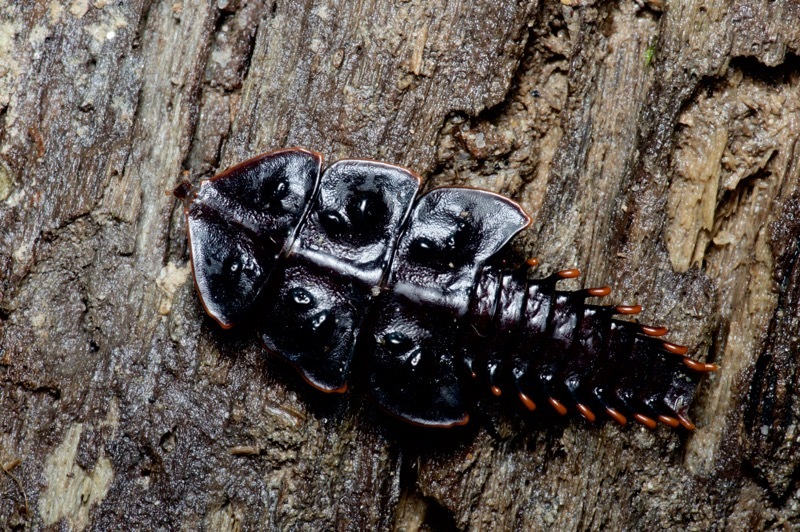 Adult males have wings and just look disappointingly like beetles. Never let it be said that I don't take photos of birds. I am always happy to take a photo of a bird, provided that it is willing to sit perfectly still and not too high up. 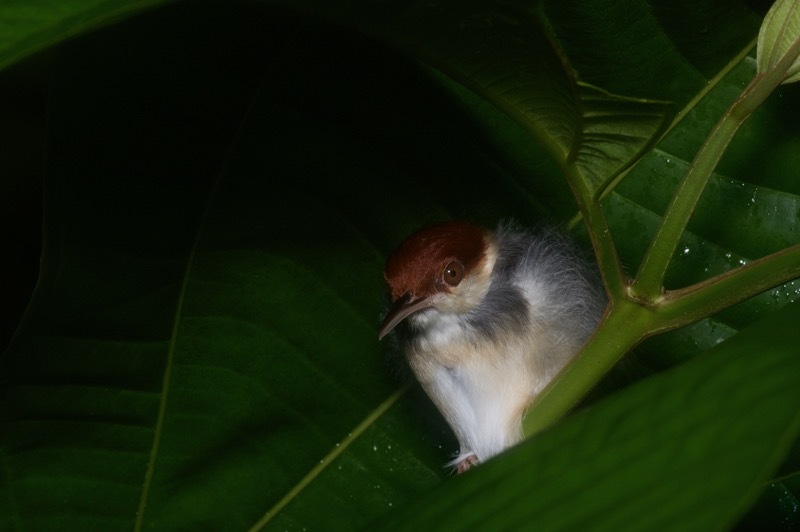 This is generally the case only for birds that are sleeping at night in the forest. 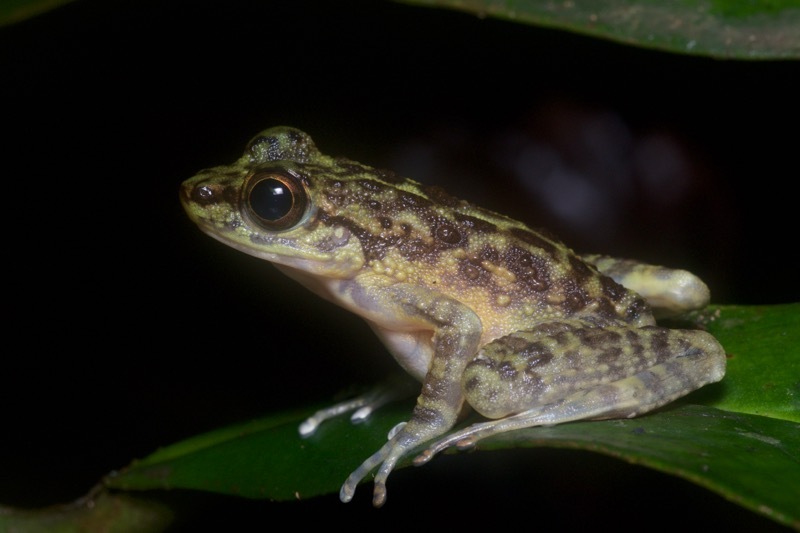 We saw quite a few frogs of species that we had also seen the previous night, and I didn't always take the time to photograph them. One that I did stop for was this cute li'l Lesser Stream Toad. 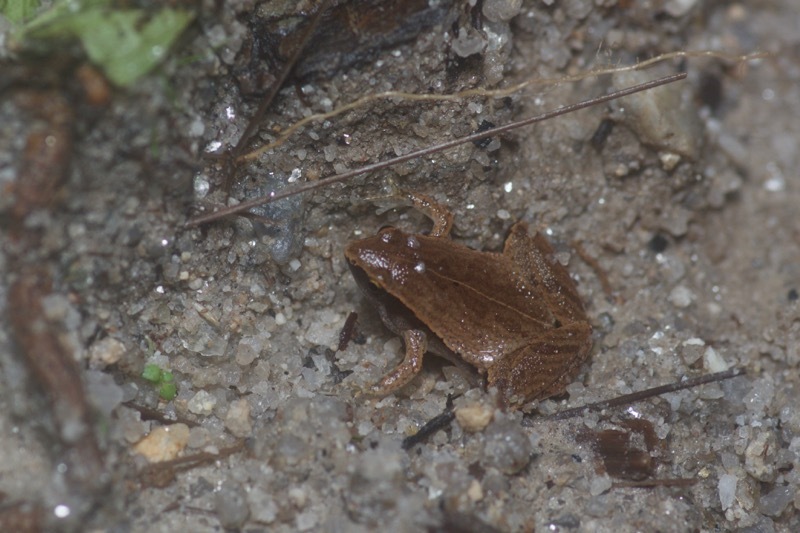 We found one new microhylid, the uncooperative and tiny Arcuate-spotted Pygmy Frog, aka Taiwan Rice Frog, aka Dark-sided Chorus Frog. I only managed one poorly focused photo before it disappeared. Kurt showed me a tree hole that served as home for at least one pair of Cinnamon Frogs. 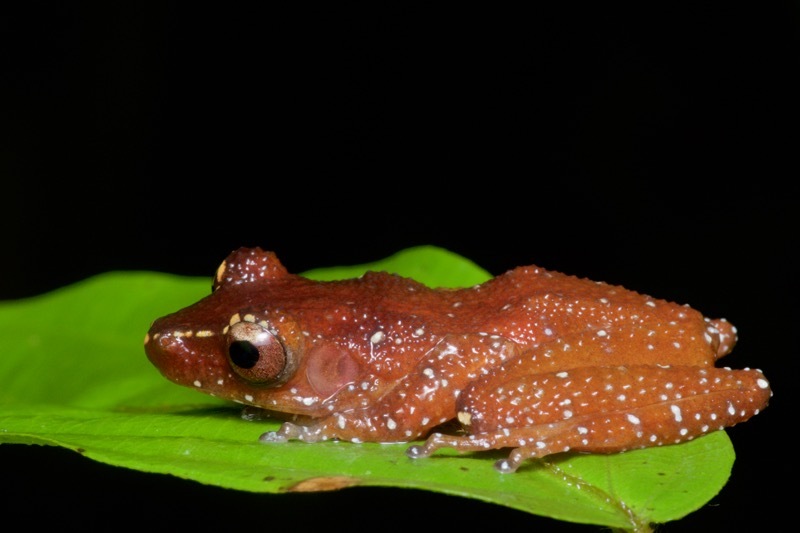 We had seen one of these beauties the previous night also, but one can never see too many Cinnamon Frogs. Boulders and plants near or in the splash zone sported the very cool Larut Torrent Frogs, which have a remarkably strong grip, scuttle sideways like crabs across wet boulders, and swim like Katie Ledecky. 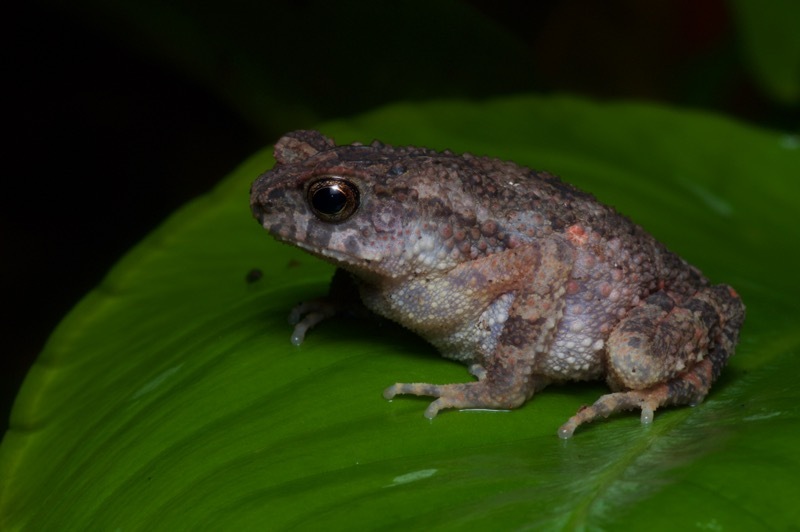 These frogs are common in suitable habitat throughout the Malay peninsula, but I never grew tired of seeing them. We saw one more new-to-me ranid at Ulu Yam, a large Poisonous Rock Frog. 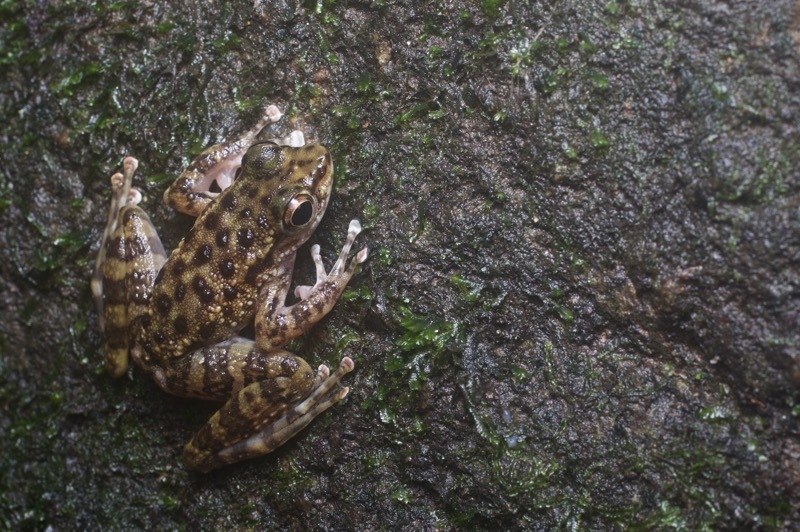 These frogs like to hang out near waterfalls, and have poisonous skin secretions that will kill other frogs that come into contact with them. Good to know, especially if you are another frog. 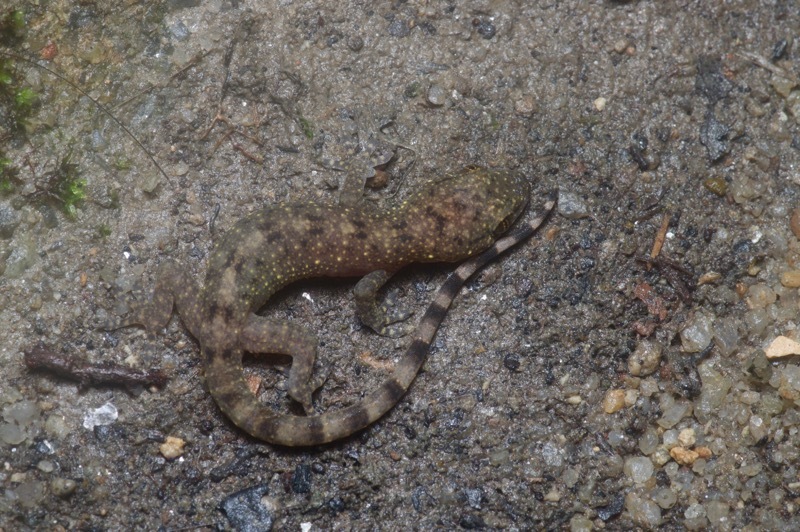 That night I found my first sleeping earless agamid. These skinny little guys look particularly helpless all spread out on a leaf. We would find many more sleeping on future nights, but I never saw another one by day. This was the standard pattern for agamids; despite being diurnal, they were all much easier to find at night than by day. 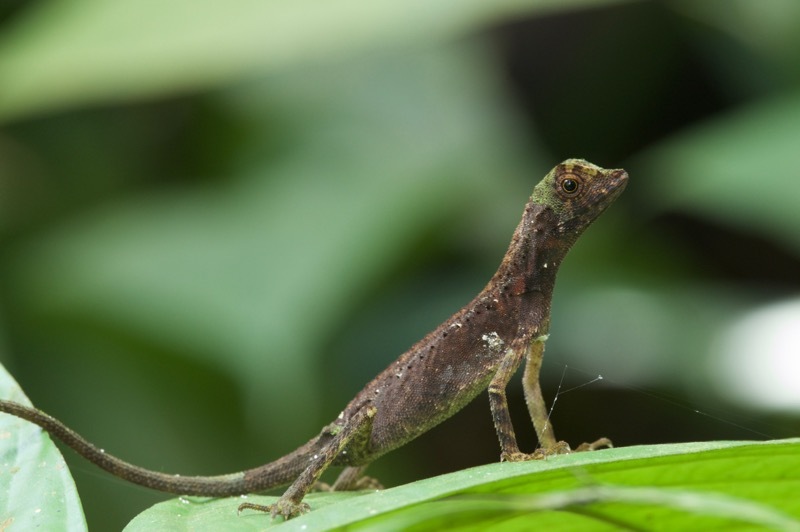 I have had the same experience with Enyalioides and Anolis in Amazonia. True to his word, early in the evening Kurt spotted a large adult male Gonocephalus grandis sleeping awkwardly in the vegetation. Who painted this lizard, and why? So awesome. Juveniles and females of this species aren't nearly as dramatic, lacking the crazy crests and the bright colors. 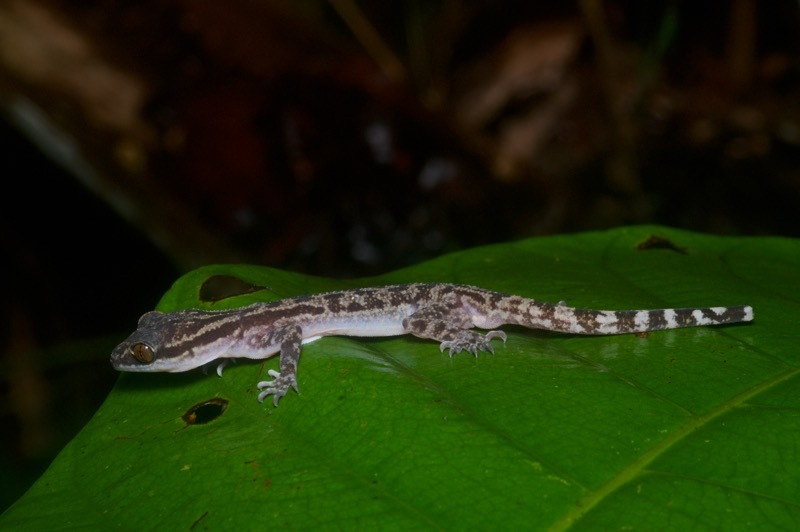 No night in a Peninsular Malaysia rainforest is complete without at least a few Cyrtodactylus geckos, most often this species. 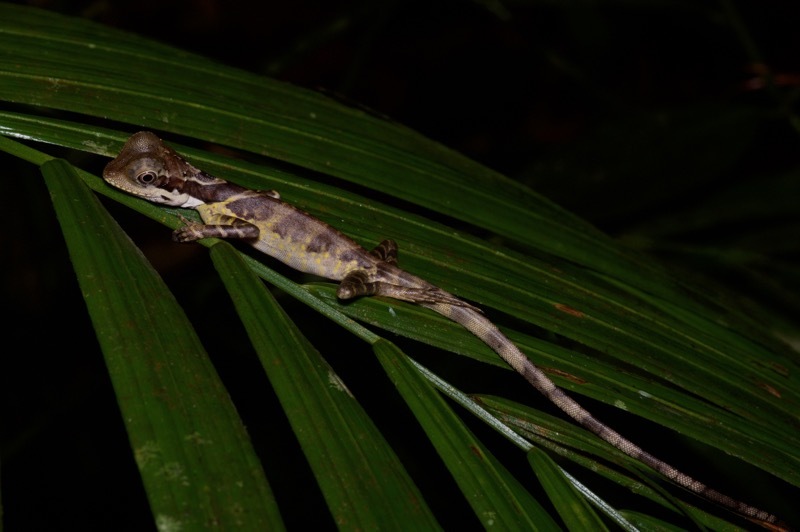 It was a good night for geckos in general, partly because our wanderings in the forest took us to various buildings where geckos had moved in. 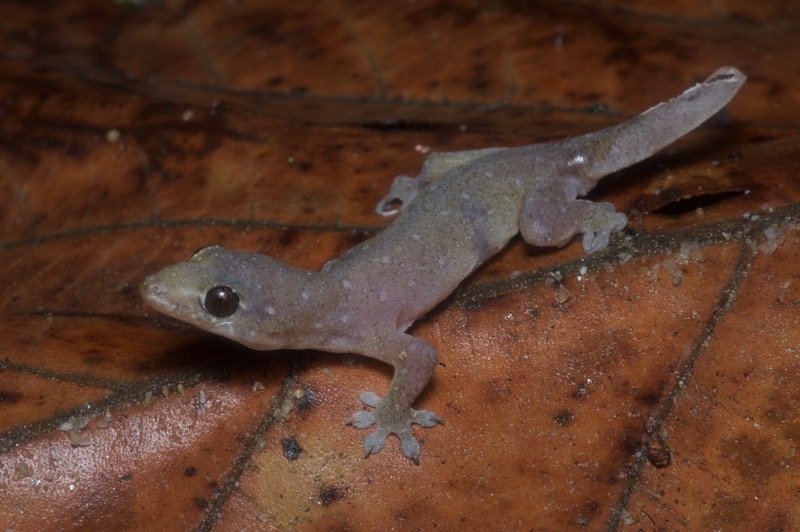 The Common Four-clawed Gecko, a widespread house gecko that I had seen before in Madagascar, was plentiful here on buildings. We saw a few on actual trees also. Spotted House Geckos also occupied many of the buildings, and we saw several large adults. They get quite big, though not as big as their more spectacular cousin the Tokay Gecko. All of the adults evaded us except one, and my photos of that one are crappy. But here's a tiny baby. 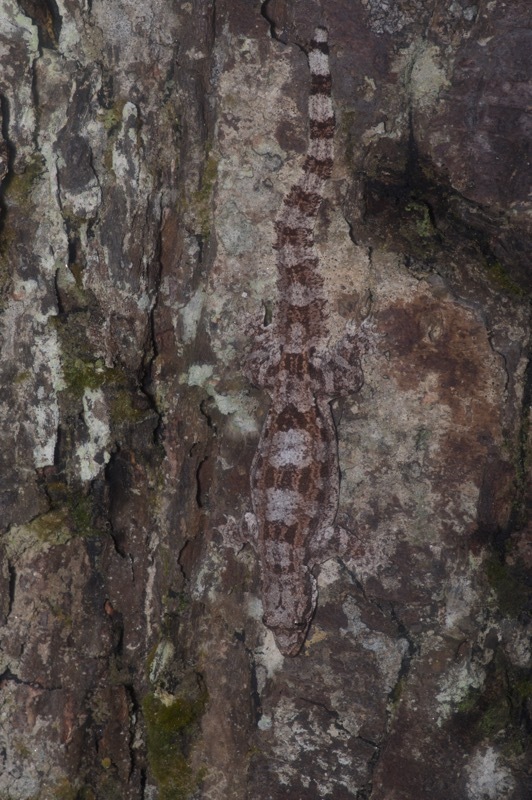 Speaking of spectacular geckos, Kurt saw this Kuhl's Flying Gecko up in the rafters of a building. We detained it for some photos on a nearby large tree buttress. We saw a couple more later in my trip, all of them on manmade structures in the forest. 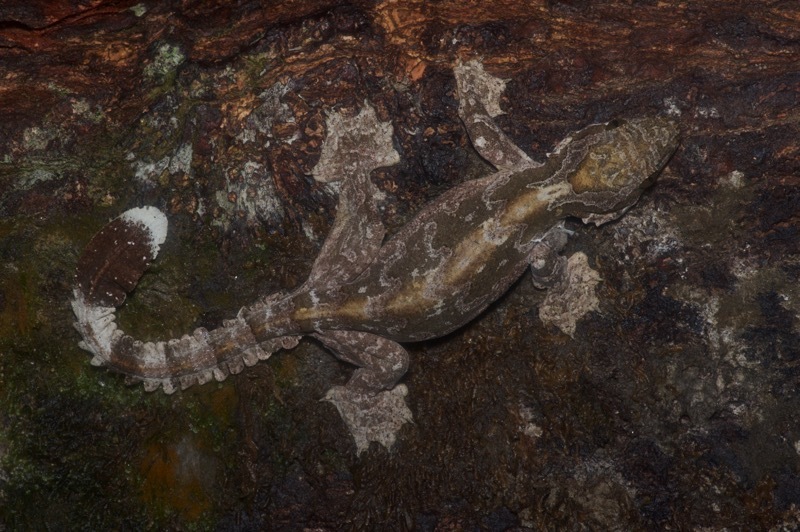 While I was occupied with photographing the Kuhl's Flying Gecko on a buttress, Kurt examined the trunk part of that same tree and discovered a well-camouflaged Frilled Gecko. This would be a gecko highlight on a night that didn't also feature Ptychozoon kuhli, but it lost a little luster in comparison. 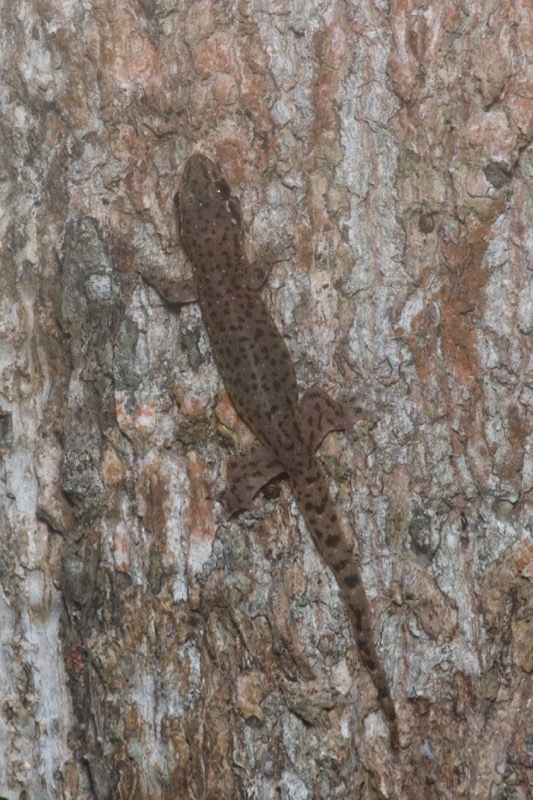 Kurt calls this the "poor man's flying gecko". 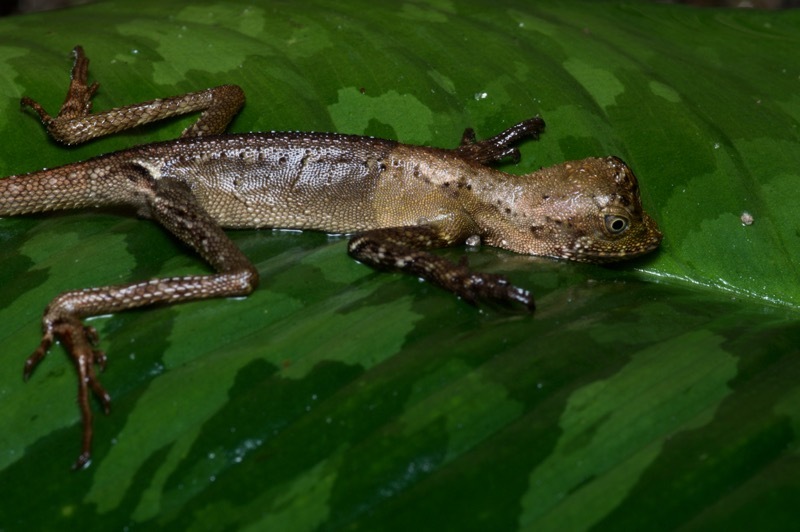 This species started out classified in Hemidactylus in 1890, was soon sold to Mimetozoon where it stayed for the early part of its career, before being acquired by Platyurus in a three-team deal in the early 60's. There it thrived for three decades before being snatched up by Cosymbotus in the 90's. Finally, in the late 2000's, it made its triumphant return to Hemidactylus, where it will hopefully retire. We got off to a poor start in the snake department. 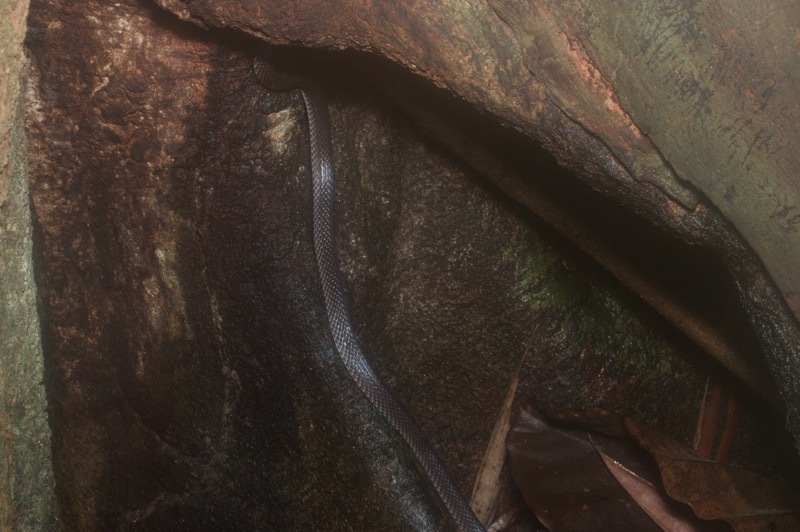 Kurt glimpsed a Striped Coral Snake (Calliophis intestinalis) in the leaf litter, but it disappeared immediately and we couldn't find it again. I never saw it at all. Later I checked out a promising buttress and saw a long thin dark snake probing its crevices. We were afraid it would get away quickly so Kurt captured it with tongs and we brought it to a relatively open area on the trail for photos. 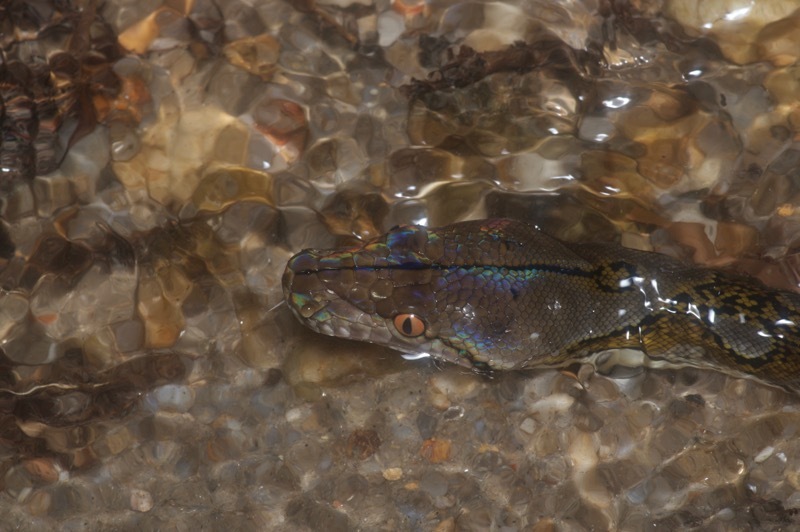 When carefully released, the snake shot off and disappeared in about two and a half seconds. D'oh! I did manage to get one or two proof-of-existence photos before it had been captured. 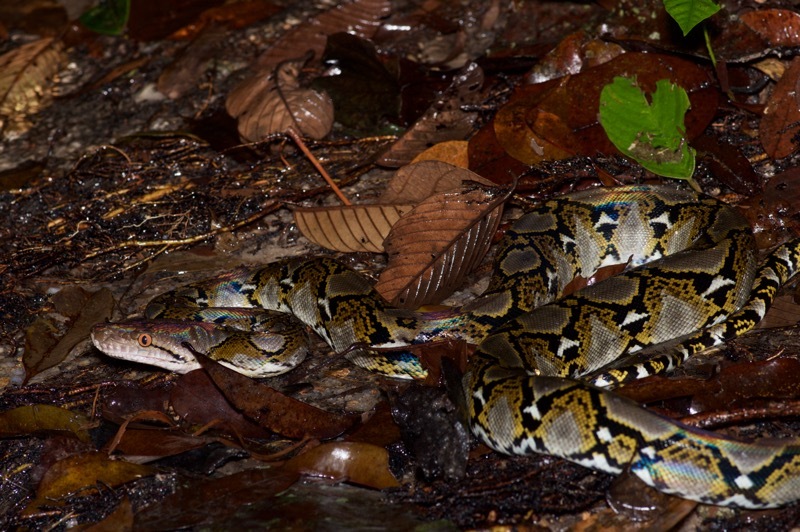 Our snake luck improved dramatically when Kurt found a beautiful Reticulated Python navigating its way down a stream. It wasn't a huge snake as pythons go, perhaps five or six feet long, but it was gorgeous, and it was a friggin' Reticulated Python in its native habitat. 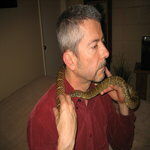 Kurt eventually won an argument with the python about whether it would settle down for photos. 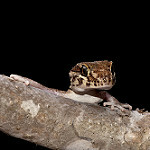 Ribbit wrote: Kurt calls this the "poor man's flying gecko". Hmmm... I think someone else (who never got to see the real flyer, actually) coined that label for the first time. Loved it, thanks again, John! Beautiful retic, nice dragons! Thanks Jeroen! I guess that makes you the poor man? RETIC! That alone would be a dream come true. Loving these posts! What a marvelous trip and you have just reported on the first couple of days! Being a lizard aficionado I really loved the picture of Great Angle-headed Lizard (gonocephalus grandis). 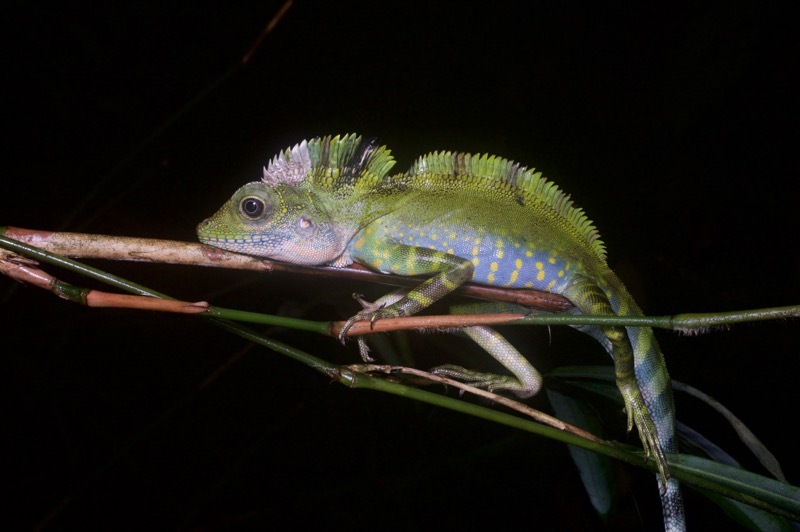 It's vertebral and cephalic crests are strikingly reminiscent of the Emerald Basilisk (Basiliscus plumifrons) from Central America even down to its green coloration. 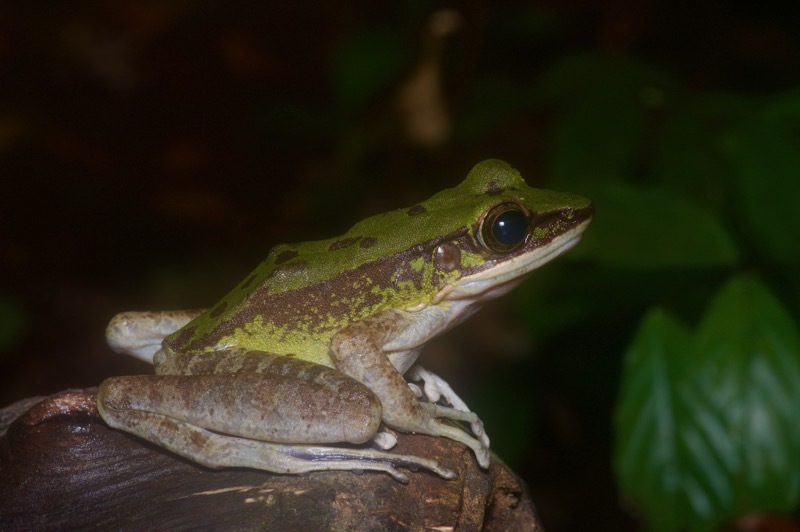 It is interesting that herps in Malaysia have developed flight as a means of travel with flying frogs, flying geckos, flying Draco lizards, and of course flying snakes (Chrysopelea. It sure beats crawling through the jungle. I always look forward to your photos and your narratives. Ribbit wrote: Thanks Jeroen! I guess that makes you the poor man? dwakefield: Thanks! It was definitely an incredible moment when Kurt called out "python!" and I saw what he was wrangling. mothman: Thanks! Kurt and I also discussed Basiliscus plumifrons. That species would fit right in with the various crazily-crested SE Asian agamids. I was really hoping for a flying snake to match the flying frogs, geckos, and lizards I saw, but no such luck. Yet another reason to go back. Jeroen: I will not cry too much for you. You guys saw a lot more snake species than I did! Wonderful post again, John. That lovely, friendly, short-tailed dog is Betty. She rarely follows me lately, but the friendliest of them all, Bobby, never fails to follow me whenever I am there! Jeroen - the real flyer is actually relatively easier to find! Betty was a very sweet dog. May she live to follow many a park visitor. Wonderful post. Great photos and I loved the narrative. The convergence in lizards between these agamids and Central American's iguanids is amazing to see. Man, I never get tired of these posts, John. Fantastic...everything. I saw no more flying lizards in Malaysia. That's one reason among many to go back soon. Not to sound meh, blah, or otherwise jaded, but there's a veritable Draco infestation on the trunks of the palm trees that surround the parking lot of that little forest park near my house. One practically trips over the buggers. I'll be sure to put that on your agenda when you return! You and your traveling friends never cease to amaze me. One of my bucket lists items it to herp with you by some coincidence, but I haven't been where you've been - especially internationally. I viewed this and all recent Malaysia posts and enjoyed them more than most books & movies. You serve as an inspiration, to be sure. Ameron wrote: I viewed this and all recent Malaysia posts and enjoyed them more than most books & movies. I'll keep y'all updated. 25k words done, about nine times that much to go!